Meyerbeer's Le Prophete (1849) came to me from Toulouse by way of Culture Box. My only live experience of Meyerbeer was L'Africaine at the San Francisco Opera. I begin to think Meyerbeer is neglected, perhaps not in France but certainly here. Perhaps Yannick will change this. (f) a new heavier type of dramatic tenor as the featured hero. 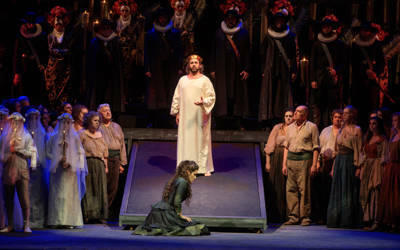 Two of his most famous operas concern European religious minorities, here the Anabaptists. They are at war with the main population. We in America have had a great political civil war, but until the recent events have never experienced religious wars. Many may dislike people from other religions, but the phenomenon of taking up arms against them has not happened. We love our religious freedom. You have to enjoy John Osborn to like this performance. There is a lovely duet between Aldrich and Fomina. Two hours in we have kitschy almost naked ladies. People are singing in Latin. There is a huge role in this opera for mezzo, Fidès, originally sung by Pauline Viardot. I like Kate Aldrich but imagine Viardot must have been heavier. I think this whole scene is supposed to be in a church. Jean makes a big entrance in a crown and white robe. He says he's the son of god and Fidès calls out "my son." He says "who is this woman?" Someone says she blasphemes. Women surround her. She sees that things will go bad for him if he admits he's her son. He's supposed to be god's son. So then the coronation goes on. This music is interesting and often quite beautiful. It follows in the footsteps of Gluck who was very influential in France. There is no discernible recitative, but there are arias. The orchestration is like Berlioz to my ears. For my ears it's more musically sophisticated than bel canto. There is only occasional ornamentation with nothing like the extended coloratura found in the bel canto operas of the era. However, at the beginning of Act V there is an enormous, florid aria for Fidès. Viardot may have insisted. The music is pleasing, but the plots are outside our knowledge. It is not, I think, a coincidence that I have only seen L'Africaine which is about Vasco da Gama, someone we learned about in school. I predict Le Prophete will never be popular here. The biggest problem with this performance is that the voices need to be heavier. Here toward the end is an incredible trio. All in all I enjoyed it.